At least 10 Australian residents may be among the hundreds of thousands of Uyghurs imprisoned in the Chinese regime’s “re-education camps” in Xinjiang province, prompting safety concerns from family members in Australia. Nurmuhammad Majid, president of the East Turkistan Australian Association (ETAA) said that he is aware of nine Australian residents and one Australian citizen, who have not made any contact with family members since traveling to China. “[M]ost of the visits happened at end of 2016 or 2017. Then after that period, the families did not hear from them,” Majid told The Epoch Times. Majid said the Australian residents who are currently detained went to China solely to visit family but instead had their passports confiscated and then sent to “political study courses” in China. “[S]ome of them have been confirmed by those living in Australia stating that they are locked up and their passports seized by authorities. “[T]hese political studies [are] now identified by the international communities as the detention camps which deprive them the basic human rights of the Uyghur people,” Majid added. Testimonials from former Uyghur detainees have revealed widespread human-rights abuses within these purpose-built “re-education camps,” where over one million Uyghurs are detained. Mihrigul Tursun, a 29-year-old Uyghur woman, spoke of her accounts while being detained three times. “I spent 10 months in the camps in total, and experienced physical and psychological torture at the hands of government officials,” Tursun said at a U.S. Congressional Hearing (pdf) on Nov. 28, 2018. Tursun was first detained by Chinese authorities in May 2015, when she arrived in China from Egypt with her three two-month-old triplets. Upon arrival, authorities took her children away and then interrogated her. Her passport, ID cards and cellphone were confiscated. “Then, they handcuffed me, put a dark sack over my head, and took me to a detention center,” Tursun said. After three months, she was “paroled” because her children were deemed “sick,” which was suspicious as her children were healthy prior to arriving in China. Unfortunately, her eldest son died the next day. During her detainment, her cellmates, whom many were well-educated professionals such as teachers and doctors, were forced to memorise the rules of the concentration camp, chant slogans hailing the Chinese Communist Party (CCP), and renounce their language and religion. Many were tortured, beaten, poisoned, and killed by injection. Tursun personally witnessed nine deaths during her third detainment. Tursun eventually arrived in the United States on Sept. 2018, through assistance from the U.S. government. On Nov. 26, 2018, scholars from 26 countries signed a public statement demanding the Chinese regime abolish its mass internment “re-education” camps in Xinjiang. “As concerned scholars who study China, the Xinjiang Uyghur Autonomous Region (XUAR), Central Asia, and other related regions of the world, we issue this statement to highlight our concerns and to call the international community to action in relation to the mass human rights abuses and deliberate attacks on indigenous cultures presently taking place in China’s XUAR. The signatories to this statement are united in viewing the present situation in this region of China as one of significant international concern,” the statement says. “Their daughter and son are still in Australia … They have been very angry, shocked, the kids cry and [are] very stressed,” Hiwilla told SBS news. In 2017, Almas Nizamidin, an Australian citizen, went to Urumqi, the capital of Xinjiang in search of his wife who was detained by Chinese authorities. Nizamidin flew back to Xinjiang immediately after hearing the news that she had been taken from her home by several plain-clothes policemen under no official charge. Concerns for the safety of Uyghurs in Australia have also been raised. Nurmuhammad Majid of the ETAA was aware of an incident where an Australian resident was called by the Chinese police via FaceTime on WeChat. The Chinese police harassed their family members in China and demanded cooperation and information from the relative in Australia. 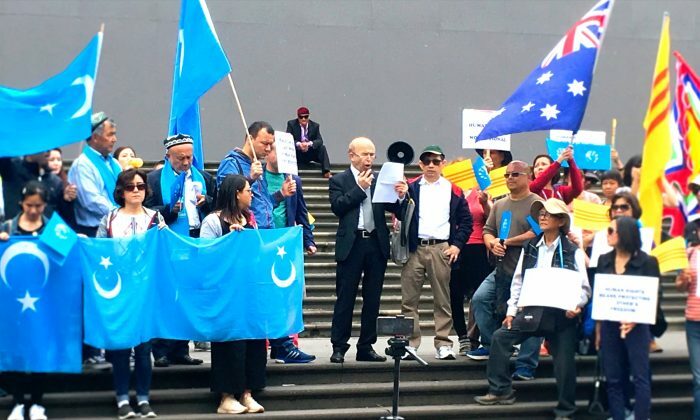 Magid said there could be more than the 10 confirmed cases of Australian Uyghurs imprisoned in Xinjiang, given that other Australian Uyghurs could be isolating themselves from the community due to fear by the CCP. “[T]here is no guarantee that the Chinese government can interfere the normal lives and can’t harass the Australian Uyghurs when they act or leave or reside in Australia,” Majid added. Australia Responds, But Is It Enough? Omer Kanat, Executive Committee Chairman of the World Uyghur Congress told The Epoch Times that Australia could do more. On Dec. 3, 2018, Australian Labor MP Michael Danby, introduced the Australian Magnitsky Act that would see human rights violators face tough sanctions once it is passed. “Communist Party viceroy, Chen Quanguo, with his monstrous plan to incarcerate a million Uyghurs in concentration camps, will not be forgotten by legislation like this if it is passed and a future federal government has a chance to name him,” Danby said in Parliament.